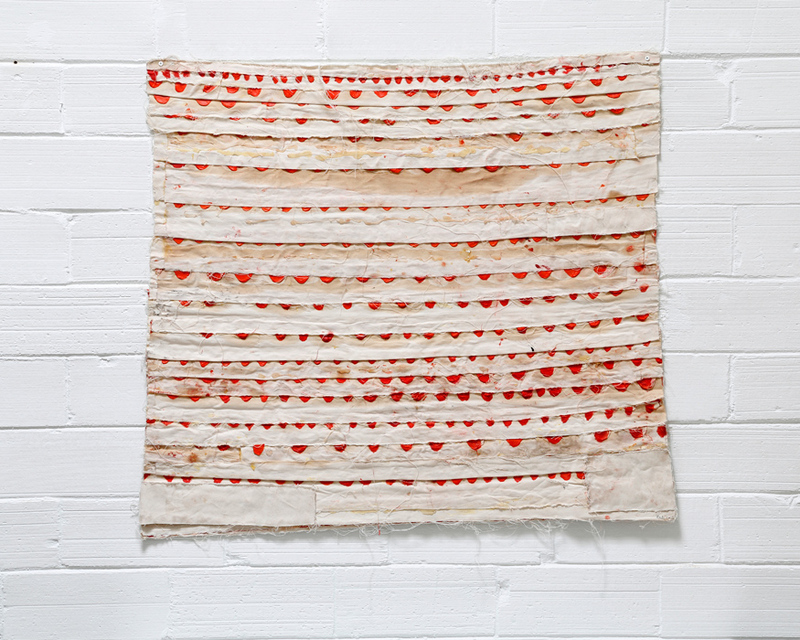 SITE131 presents a new art conversation in Simply BOLD with two international artists: Berliner SATI ZECH’s irregular lush red canvases and Colombian NATHALIE ALFONSO’s eradicated 40-foot charcoal strike across the gallery. 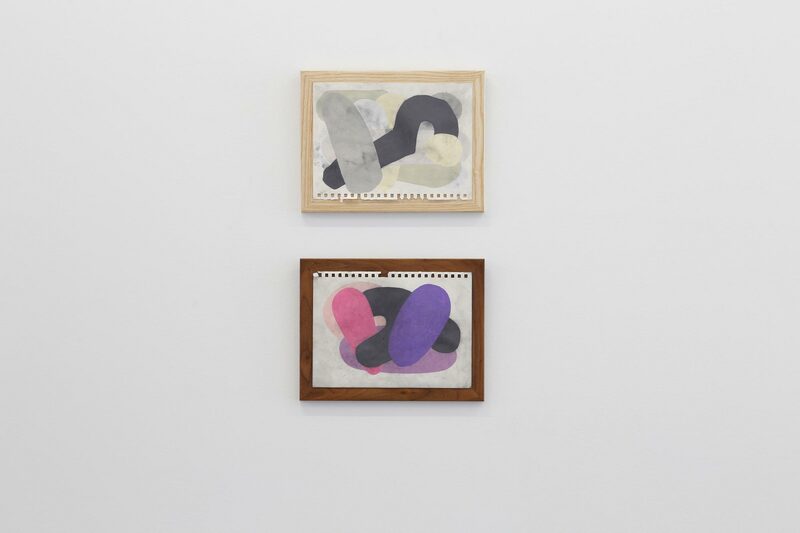 Chicagoan TONY LEWIS’ small and oversized graphite drawings meet Texan artists JASON KOEN’s intimate concrete rectangles and HARRIS CHOWDHARY’s invented aluminum structures. 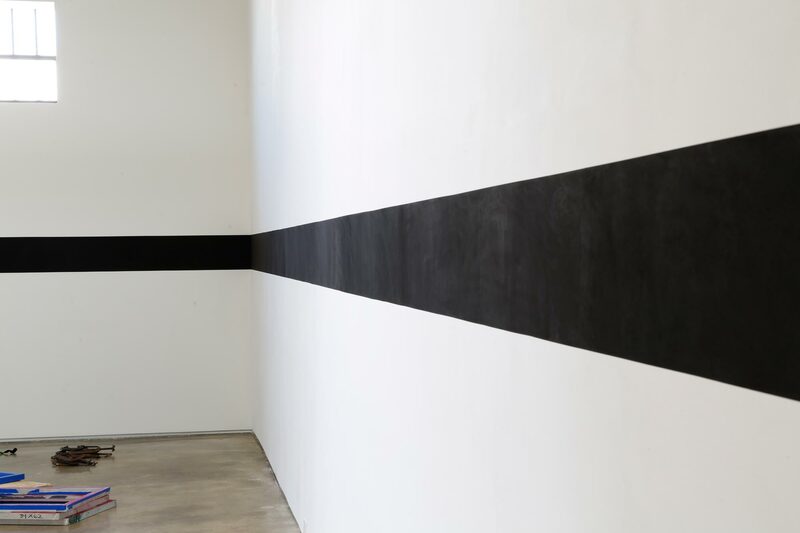 At SITE131’s white-cube space in the Dallas Design District, Nathalie Alfonso’s crisp charcoal line drawing feels right. 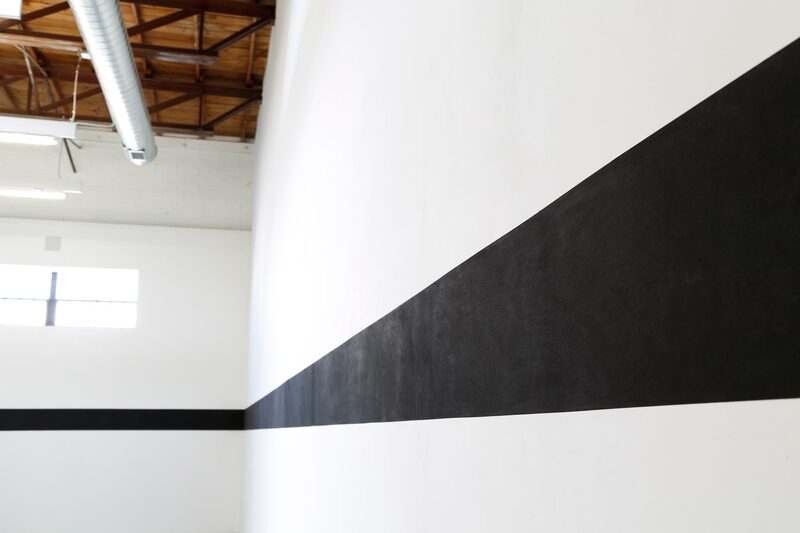 In canonical minimalist style, she employs a single geometric form, elongating it to envelop the gallery space. 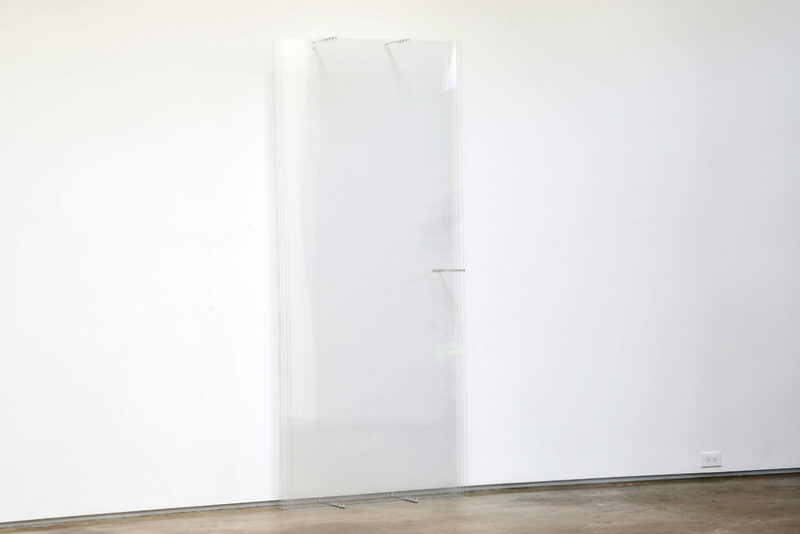 Perhaps Alfonso’s performance begins here with this feeling, that the viewer is looking at “Art,” before she proceeds to smudge, smear, and finally dissolve the line with rags, which will punctuate the space for weeks to come. 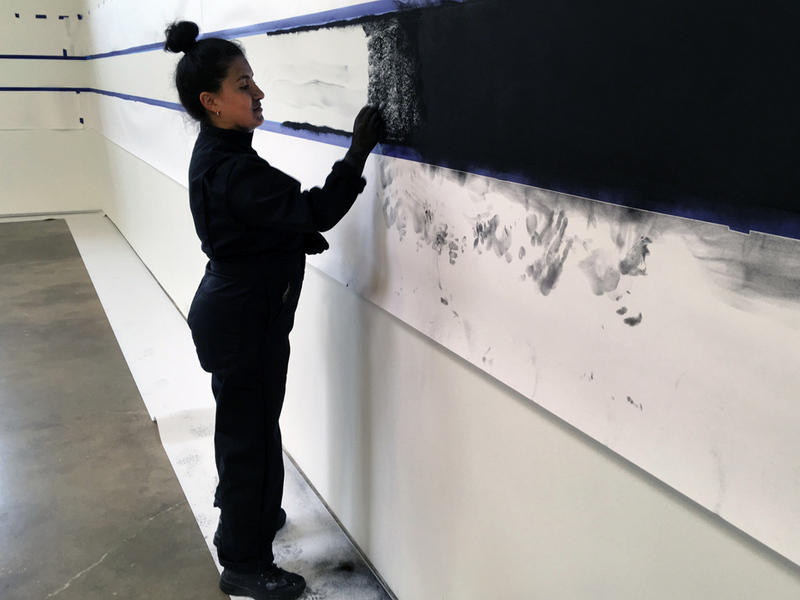 Informed by her experience cleaning houses in Miami, Alfonso’s performance (that she has been doing since 2015) explores notions of invisible labor, fusing together cleaning and mark-making. Since moving to Dallas to begin an MFA program, Alfonso’s biography has given rise to a new valence to the work: while once it might have been associated with her under-recognized cleaning jobs, the performance now layers in her new challenges as a performance artist in an arts ecosystem that does not treat immaterial art (like performance) with the same regard as it does other media. In Open], Alfonso has modified her line into a bracket, the punctuation mark that sets off non-essential information. By doing so, Alfonso frames her toil as parenthetical but perhaps also sets out to erase this designation. 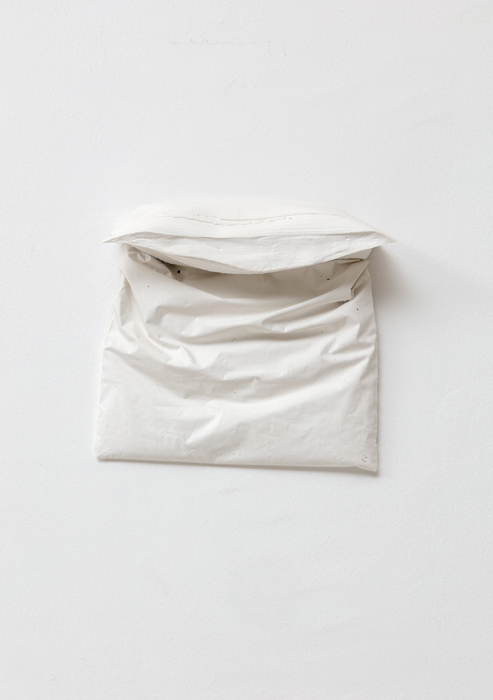 When I speak with Alfonso about her performances, she refers to them as “unresolved,” a sentiment several of the artists in Simply BOLD seem to share or gesture towards. 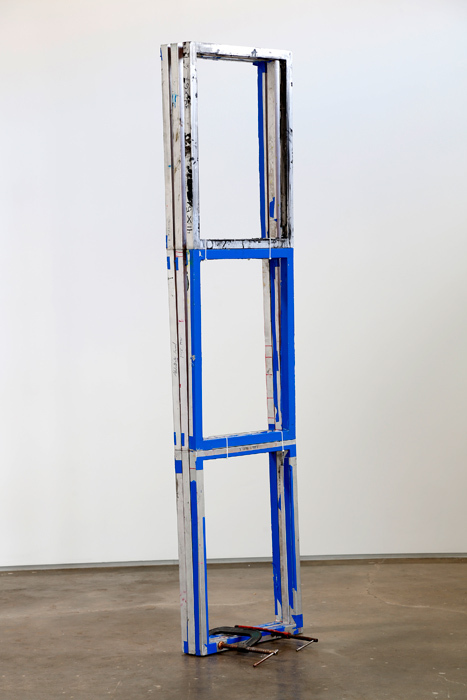 Harris Chowdhary and Jason Koen use the language of “models” and “tests,” rather than “works,” to refer to their sculptures. Such framing points to the unsettled question of materiality in their respective practices. 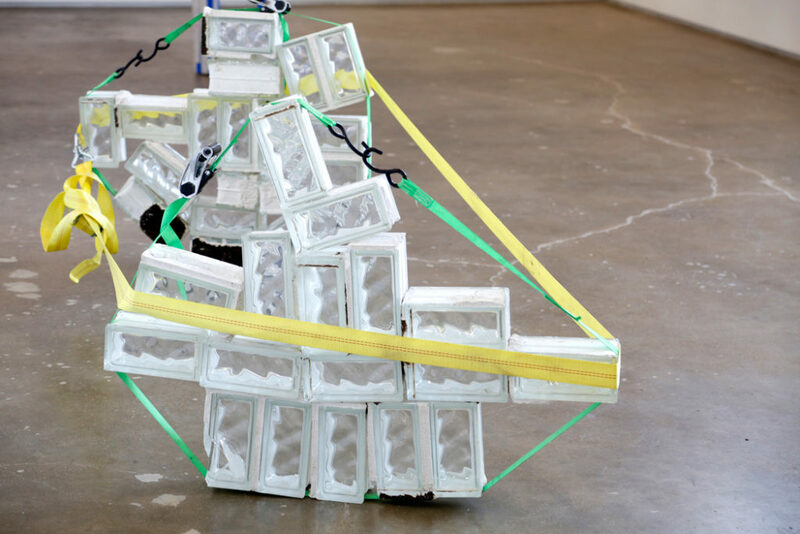 Chowdhary works primarily with discarded materials salvaged from around Dallas. Mostly industrial scraps and fragments, the materials speak of an interchangeable and ultimately nondescript postmodern architectural style, used to build frozen yogurt shops and medical centers alike. Chowdhary is not convinced of the neutrality of these modular bits, which he reconfigures into sinister foreign structures. Having lived in Dallas his whole life, Chowdhary speaks of the “oppressive normativity” of new developments here. One “model,” comprised of the metal frames used for silkscreening, invites us to consider how materials literally frame our perspective of our environment. 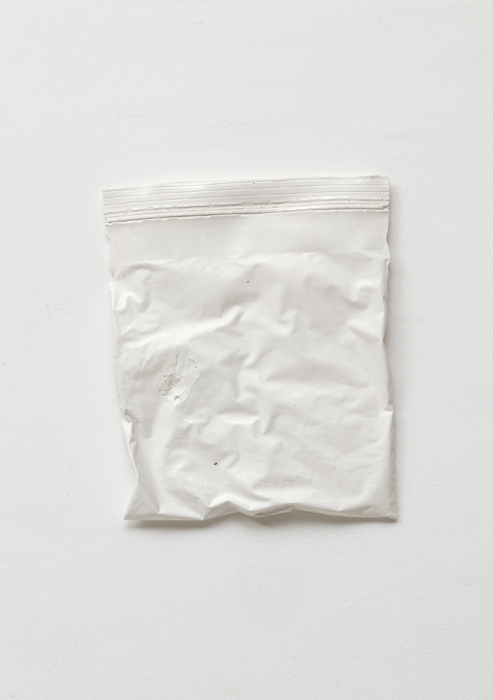 Jason Koen’s experience packaging, installing, and caring for art objects has led him to material experimentation of his own. 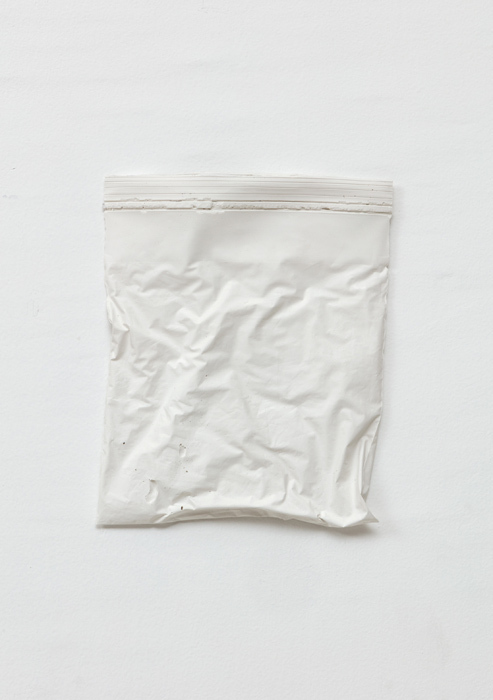 In one series of “tests,” the artist explores how molds can articulate negative space, producing new objects out of emptiness. 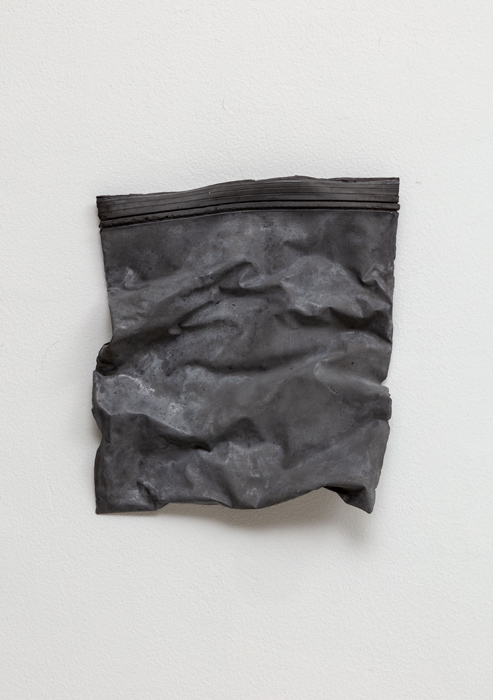 Using concrete to make his casts, Koen lends the form of the quotidian Ziploc bag weight and presence. Encountering the casts on the wall, the effect is reverential, their placement centering and even celebrating that which is usually discarded. At the same time, they undergo a transformation from object into a kind of image, as though they are presented as artwork in two dimensions. 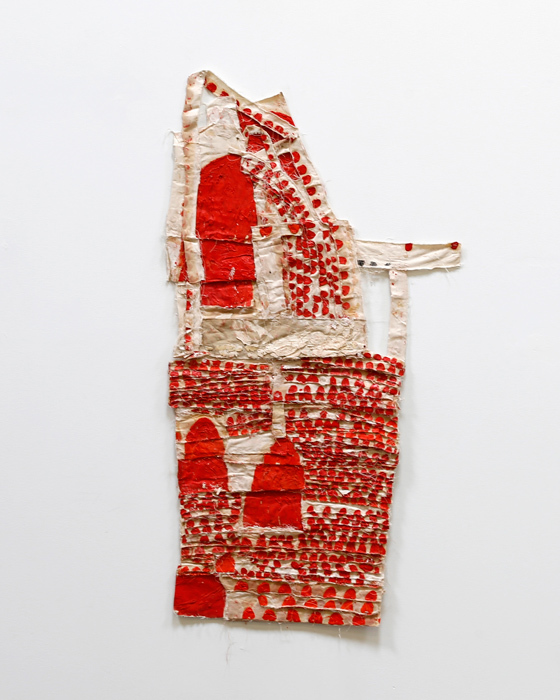 The works of Sati Zech toggle medium as well, occupying some space between collage, painting, and sculpture. 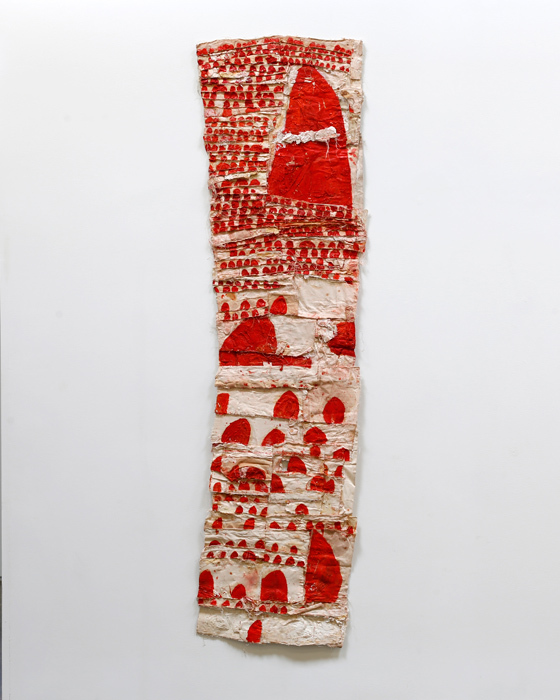 After tearing apart sheets of canvas, Zech reassembles the pieces in columns and rows with glue and thread, before adorning the canvas with repetitive patterns of crimson paint. 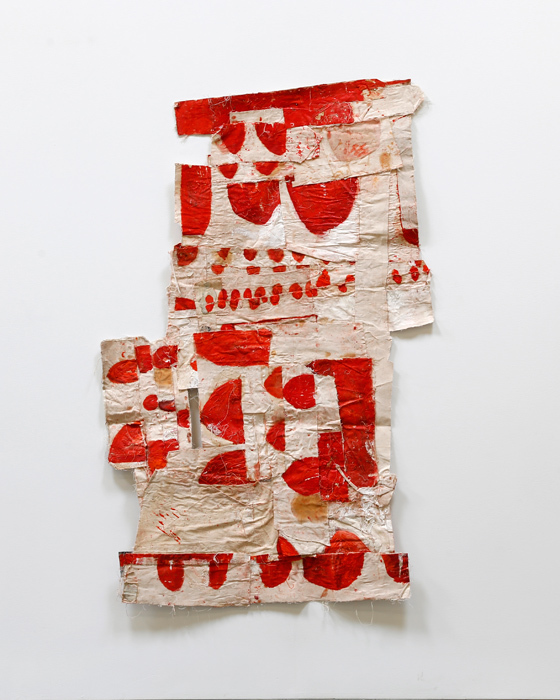 Ragged and ritualistic, her works more readily bring to mind Lascaux cave drawings than contemporary painting. Her primary interest is “language beyond normal language,” how people connect beyond ordinary speech. 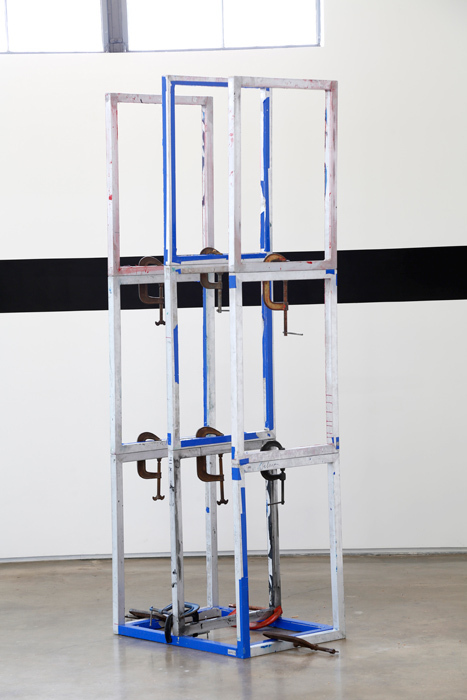 In her works that seem almost archeological, it is as if she is producing the relics of the non-verbal, connected society that she imagines, fusing together invented past and future temporalities. 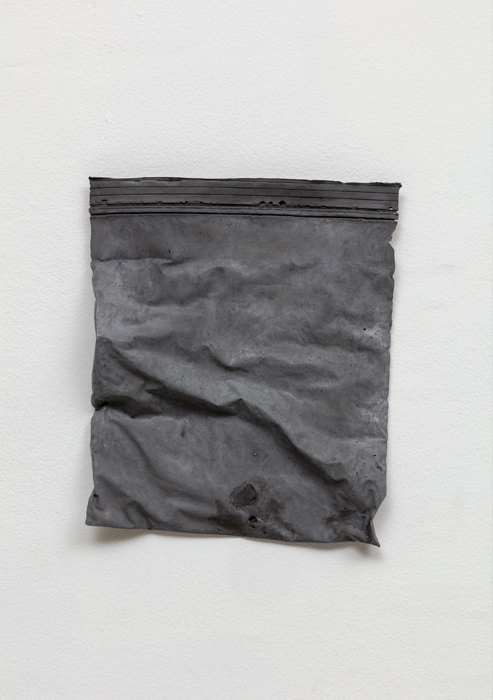 In Automatic, Tony Lewis creates small graphite impressions by flinging rubber bands that he had previously dipped in graphite powder at the paper. 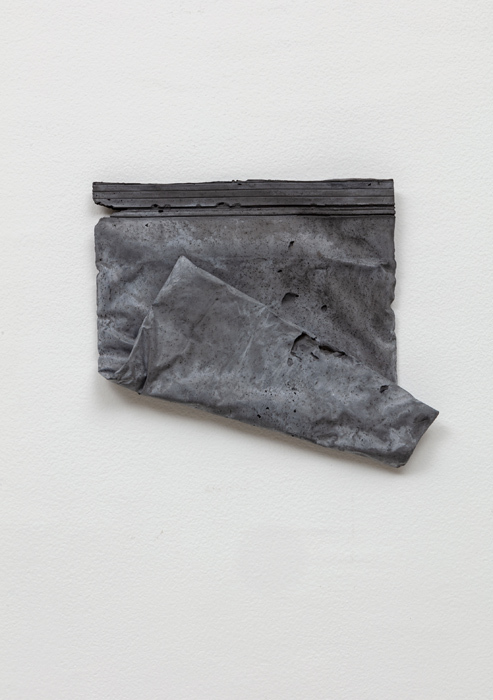 Rather than being constrained by the unforgiving nature of graphite, he plays with its propensity for chance. 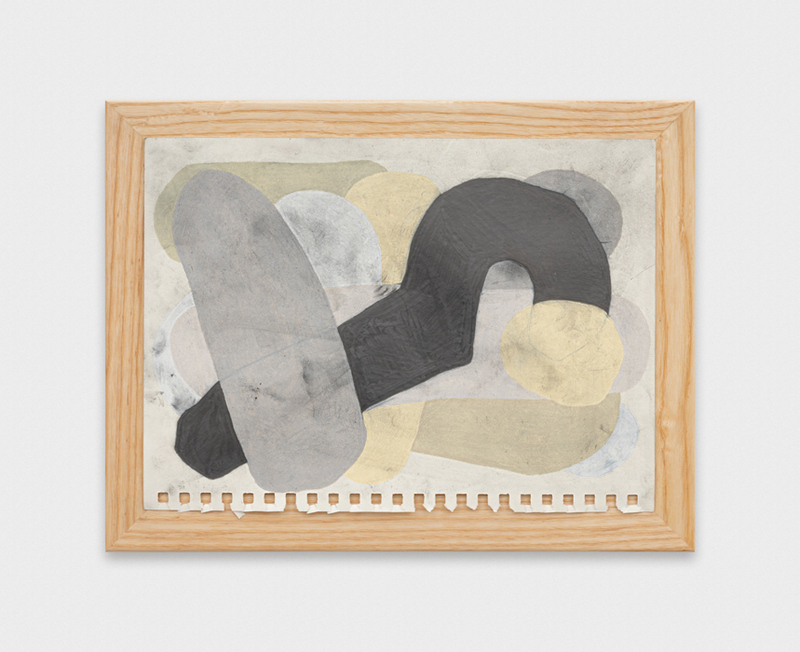 In Untitled, Lewis integrates organic shapes of both graphite and colored pencil. The forms seamlessly overlap, no trace of friction, yet at the same time the rendering is smudged with graphite fingerprints. 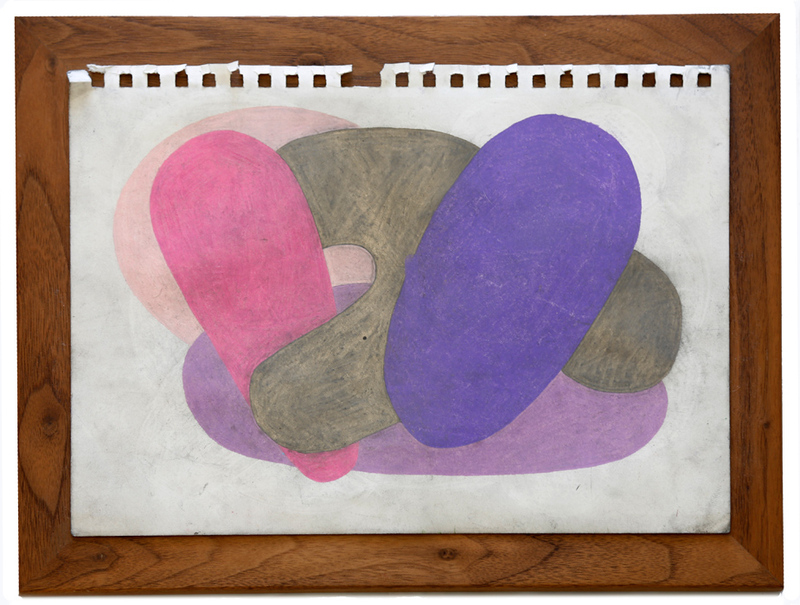 The work is executed on notebook paper, suggesting it is one of several explorations. 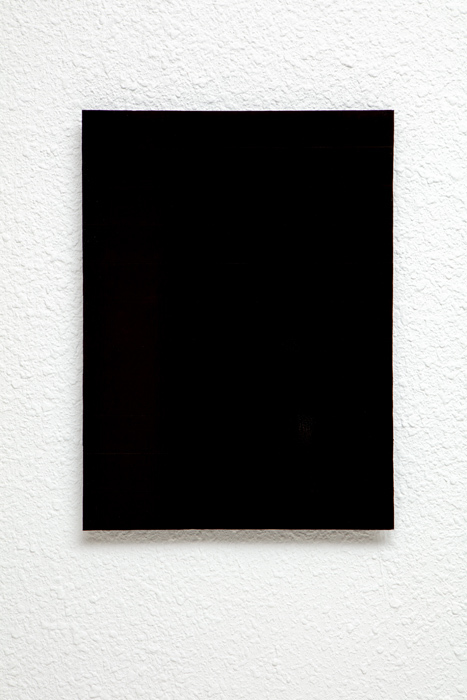 The paper is then grafted onto board, as if after some consideration the artist had approved his own hypothesis. Alfonso’s performance ends when she has nearly erased the line of her own construction. The wall may be almost back to white, but Alfonso stands before us covered in dust, as if she has just stepped out from inside a chimney. Perhaps this is the task of the artist, to tangle and explore for us and to come out the other end with more mess than order, with more questions than resolutions. 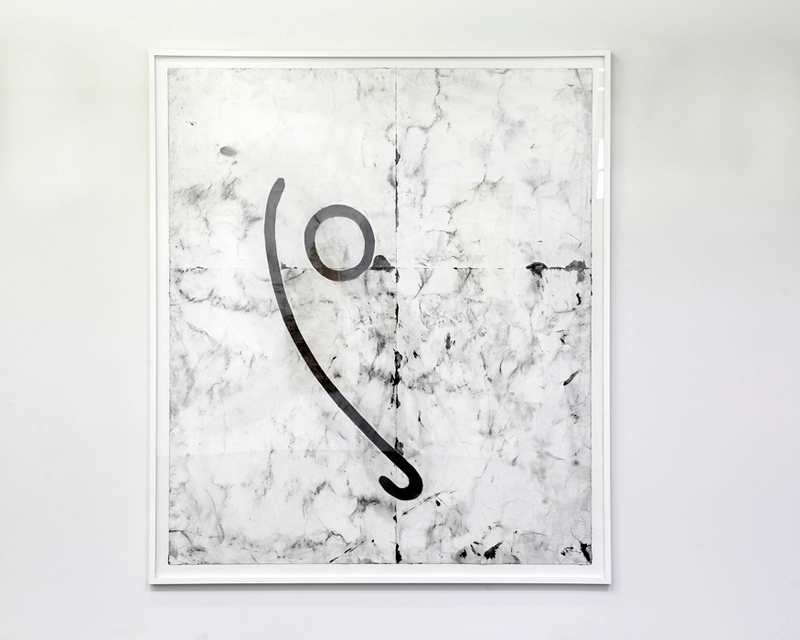 Nathalie Alfonso, Open], 2019, charcoal, rags, paper"
Harris Chowdhary, Untitled (glass brick 3), 2018, glass bricks, SmartStraps 159, 35" x 12" x 36"
Harris Chowdhary, Untitled (silkscreen frame 4), 2018, aluminum silkscreen frames, vices, zip ties, 22" x 12" x 93"
Harris Chowdhary, Untitled (silkscreen frame 6), , 2018, aluminum silkscreen frames, vices, 25" X 31" x 93"
Jason Koen, Untitled, 2018, cement, 8.5" x 6.5"
Jason Koen, Untitled , 2108, wood, polypropylene, wax, 20" x 15"
Jason Koen, Waterfall, 2019, acrylic, aluminum, steel, 91" x 38" x 14"
Tony Lewis/Green, Untitled, 2018, colored pencil, graphite powder, tape on paper, 9 x 12"
, mixed media, cotton, plaster, oil, glue, 97x27"
Sati Zech, Bollenarbeit NR 274, mixed media, cotton, oil, glue, 33x37"
Sati Zech, Bollenarbeit NR 332, , mixed media, cotton, plaster, oil, glue on paper 40 x 41"